October 16, 2014 -- 3D printing guru Joshua Pearce wants nothing more than to provide the means of production to everyone, especially people in developing regions who must get by on very little. But there has been a drawback. Pearce researches both solar power and 3D printing and combined his specialties to develop two solutions in the form of open-source solar-powered 3D printers. One is designed for schools and businesses, the other for remote communities. The first features an array of solar photovoltaic panels and a stand-alone printer, which could be stationed in a sunny schoolyard and print anything from consumer toys to science lab equipment. “It can make high-value items for pennies, but it’s not very portable,” said Pearce. The second system is smaller and fits in a suitcase. While it doesn’t have the capacity of the less-portable model, it is a RepRap and can thus replicate itself and make parts for larger printers. Plus, it can go almost anywhere. 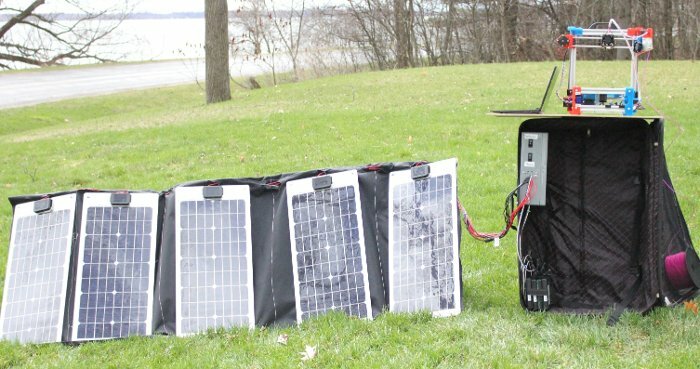 The article describing the work of Pearce and his team, “Mobile Open-source Solar-powered 3D Printers for Distributed Manufacturing in Off-grid Communities,” was coauthored by Pearce, Debbie King, Adegboyega Babasola and Joseph Rozario. And is to be published in the October Issue of Challenges in Sustainability. Michigan Technological University (www.mtu.edu) is a leading public research university developing new technologies and preparing students to create the future for a prosperous and sustainable world. Michigan Tech offers more than 130 undergraduate and graduate degree programs in engineering; forest resources; computing; technology; business; economics; natural, physical and environmental sciences; arts; humanities; and social sciences.